As a WordPress veteran of 4 years or so I constantly check out any post that says things like “10 must have WordPress plugins” or “Tips for WordPress Users”. One thing that seems constant on these lists over the past year or two has been the recommendation to install a WordPress Plugin called “WP-Touch”. This plugin reformats the CSS on your WordPress blog to be “optimized” for the iPhone and other mobile devices. WP-Touch has a huge following and a ton of people use it – but that doesn’t make it good. I am anything but a designer and I too have dabbled in using these plugins. In the end I usually always turn them off, not because they don’t work, rather because they are down right ugly and make the user experience suffer on your site. 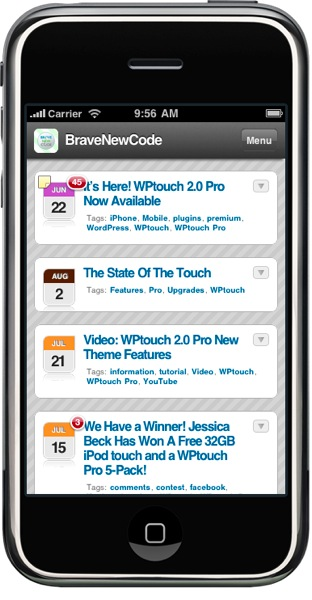 There is nothing more annoying to me than to be out on my iPhone and hit a link to a blog and be greeted with the WP-Touch theme. Perhaps I am alone in this thinking, but I think it looks terrible. Instead why not just make sure that your site works on the iPhone in it’s ‘normal’ state? The iPhone (and all iOS devices for that matter) is designed to work with the web the way it is, not for the web to reconfigure itself to work with the device. In fact I know I am not alone, just take a look at what Ethan Marcotte on A List Apart had to say on the matter of responsive web design. Now he is not talking specifically about the same thing, what he does show though is that you can make a site that looks and acts very similar on all devices. That just may be the key to making blogs more iPhone sized ready – but in the end is it really so hard to double tap of the body of text you want to read? When a new plugin called PadPressed came out, purporting to take your WordPress blog and make it look like a native iPad app, I went out and bought it and installed it. Today if you view this site on your iPad you won’t see that plugin. It is no longer active or even on my server. I removed PadPressed not because it was a bad plugin, but because the user experience of the plugin was massively flawed. It looked great, beautiful even to my eyes, but interaction with it and trying to use it to actually read this blogs content was less than ideal. In the end I will stick with this very simple design on the site, readable on all devices.